The primary goals of revision hip surgery are pain relief and long-term stable implant fixation. Femoral bone stock in revision arthroplasty is commonly compromised by osteolysis, stress shielding, and iatrogenic damage from implant removal and sometimes multiple revision surgeries. These challenging situations can make it difficult to attain stable implant fixation while maintaining hip stability with monoblock stems. Modular stems allow surgeons to establish stable diaphyseal fixation while attaining appropriate leg length and hip stability independently. The authors currently use a modular fluted tapered stem for most of their femoral revisions. The indications for a modular tapered stem depend on the amount of bone loss and surgeon philosophy. Some surgeons, including the authors, use this style of implant for most femoral revisions due to the ease of implantation and the versatility of the modular design. Other surgeons prefer proximal loading stems for Paprosky Type 1  (Table 1) and Mallory Type 1  (Table 2) femurs with an intact proximal metaphysis. Still others may choose extensively porous coated stems for Paprosky Type 2 and 3A and Mallory Type 2 femurs that have intact diaphyseal bone or an isthmus of at least 4 cm for a good scratch fit. Modular tapered stems are recommended by the authors and others for severe diaphyseal bone loss, including Paprosky Type 3A femurs with a diameter greater than 19 mm and Paprosky Type 3B femurs with an isthmus less than 4 cm. These situations have shown unsatisfactory failure rates with extensively porous coated stems . 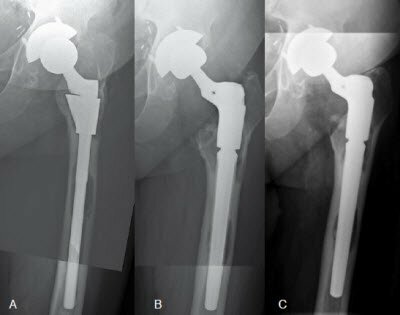 Some surgeons have had success with modular tapered stems in Paprosky Type 4 femurs with extensive loss of diaphyseal bone; however, this stem is contraindicated when stable fixation of the implant is unachievable. Megaprostheses and impaction grafting with cemented stems are other options in this situation. 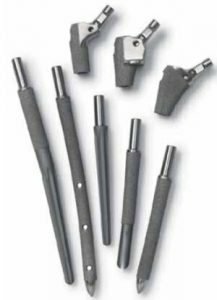 Periprosthetic fractures requiring femoral component revision are effectively treated with modular tapered stems. After exposure and implant removal, the diaphyseal femur can be prepared with tapered reamers, and a stable stem can be implanted. The appropriate proximal body is selected to restore leg length and stability. The fracture fragments can then be reduced around the stem and secured with cables. Once the tapered stem is secured in the diaphysis, the remaining proximal femur is prepared to accept the appropriately sized proximal body. The proximal body that appropriately restores leg length, anteversion, offset, and hip stability is attached to the upper portion of the stem. Multiple proximal body geometries are offered by different vendors. A cone proximal body is versatile in allowing customization of version during surgery. A tapered body can allow loading of the proximal femur within the metaphysis. A calcar body also allows loading of the proximal femur via platform loading of the remaining medial supportive bone. The major concern for this type of design is an unsupported taper junction that can be weakened by repetitive stresses. Fractures at the modular junction are reported in the literature on multiple stem designs [3-7]. Manufacturers have developed methods for strengthening the taper junction. The authors currently use a stem design that has undergone a proprietary process of roller-hardening of the taper junction (Biomet, Inc., Warsaw, IN), which, according to the manufacturer, provides up to three times more strength in cantilever beam testing. In this article, the authors review the indications, surgical techniques utilized, early clinical results, and survival of a consecutive series of patients undergoing revision THA performed using a single modular femoral revision system that offers 3 proximal body types, 5 distal stem geometries, and a wide range of offset, sizing, and auxiliary options. A query of our practice’s arthroplasty registry revealed 60 patients (61 hips) who underwent total hip arthroplasty performed with a modular femoral revision system (Figure 1; Arcos Modular Revision Hip System; Biomet, Inc., Warsaw, Indiana, USA) between December 2009 and April 2012. All had signed an IRB-approved general research consent allowing retrospective review of their charts. Figure 1. The modular, tapered titanium revision hip system used in the current study (Arcos, Biomet) features three proximal body types and five distal stem geometries with a wide range of sizes, offsets, and auxiliary options. (Photo reproduced courtesy of Biomet). Conversion procedures (7, 11%). Underlying diagnoses for conversion cases were Crowe III developmental dysplasia previously treated with multiple surgeries (osteotomies of the pelvis and femur in 1, failed hemiarthroplasty due to femoral loosening in 2, and periprosthetic femoral fracture in 1) and failed open reduction internal fixation (ORIF) of fracture secondary to non-union in three. Revisions (32, 53%). For revision cases, underlying diagnoses were aseptic loosening in 27, periprosthetic femoral fracture in 2, and 1 each component breakage, failed ORIF of fracture secondary to non-union, and instability with insufficient femoral offset. Templating can be performed to determine the planned stem length and diameter as well as proximal body size and offset. A proximal femoral osteotomy may be needed depending on fixation of the existing stem and associated proximal femoral deformity. The authors preferred exposure is via an anterolateral abductor splitting approach. The vastus lateralis and the anterior third of the gluteus medius and minimus are elevated as a continuous soft tissue sleeve from the anterior femur. If a proximal femoral osteotomy is required, the authors prefer either a Wagner transfemoral osteotomy or an anterior extended trochanteric osteotomy (ETO). These anterior-based osteotomies provide excellent access to the existing stem as well as remaining cement mantles after cemented stem removal. Another advantage of an anterior-based osteotomy is that it allows the surgeon to prepare the canal with straight tapered reamers while avoiding perforation of the anteriorly bowed femur. Once the previous stem and any remaining cement mantle are removed, the surgeon begins preparing the femur with straight tapered reamers. Reaming proceeds until good engagement of the reamer is obtained. The authors prefer to use a hand reaming technique to gain the appropriate tactile feel of the reaming. Insufficient reaming may lead to subsidence of the implant, and over-reaming will remove excess bone leading to weakening of the diaphysis and possible fracture or perforation. Inspection of the reamers provides feedback to how much bone is being removed. Care is taken to make sure the reamers are advancing straight down the shaft of the femur. Fluoroscopy may be used with long reamers to monitor for perforation or to verify the surgeon has bypassed any cortical defects. Most implant systems have markings on the reamers to judge depth based on the tip of the greater trochanter. Once adequate depth and size of reaming are achieved, either a trial or final tapered stem is implanted into the diaphysis. If a femoral osteotomy was performed, a prophylactic cable is placed distal to the osteotomy before stem insertion. This will help resist the high hoop stresses in the area, which can fracture the femur. Longer stems will usually have a bow just proximal to the flutes and tapered region to accommodate the anterior bow of the femur. The implant is driven into the femur with moderate taps of the mallet until it ceases to advance. The proximal femur is then prepared with implant-specific reamers to accept the largest possible diameter proximal body. Trial proximal bodies are placed on the distal stem until the appropriate length, offset, and anteversion are determined. The actual proximal body is then placed on the distal stem in the desired position determined by trialing and secured according to the vendor’s specifications. The hip is then reduced with the appropriate-size femoral head. If an extended trochanteric osteotomy was performed, the fragment can now be reduced and secured to the femur with cables. A burr is used to shape the undersurface of the fragment if it does not fit ideally against the femur with the prosthesis in place. The main intraoperative complications specific to modular tapered stems are femoral perforation and fracture during reaming and implantation. As described above, an anteriorly based proximal femoral osteotomy and reaming under fluoroscopy can decrease the risk of perforating the anterior cortex due to the femoral bow. A prophylactic cable distal to the femoral osteotomy will help resist high hoop stresses in this area, which could result in fracture. Postoperative complications specific to this type of stem are implant subsidence and fracture at the modular junction. As described above, hand reaming the canal allows the surgeon to have tactile feel of the reamer engaging the diaphysis. This technique aids in achieving an adequate ream to prevent subsidence while not removing excessive bone. Fluoroscopy can also be used to evaluate the size of the last reamer in relation to the size and shape of the canal. Manufacturers have made modifications to the modular junction to prevent the risk of fracture. Despite these modifications, femurs with complete loss of proximal bone will leave the modular junction unsupported and at risk for fracture. These cases may be better treated with a proximal femoral replacement. Postoperatively, patients are typically placed on weight-bearing restrictions for 6 weeks and then progressed according to the level of healing and complexity of revision. Patients are evaluated at 6 weeks, 1 year, and annually thereafter, with clinical assessment including the Harris hip score (HHS) . The surgical approach was the anterolateral abductor splitting in all cases, with femoral osteotomy required in 25 (41%). Of those two were a simple episiotomy, 3 were Wagner transfemoral, and 20 were the anterior extended trochanteric. Proximal type femoral component bodies used were cone in 54 (89%), broached in 6 (10%), and calcar in one. Proximal component diameters used were 18.5mm (A) in 20 (33%), 20.5mm in 13 (21%), 22.5mm (C) in 10 (16%), 24.5mm (D) in 14 (23%), and 26.5mm (E) in 4 (7%). A 28.5mm diameter (F) is also available. Standard offset proximal bodies were used in 25 hips (41%), while high offset bodies with an add femoral stems were straight tapered splined (STS) in 55 (90%), bowed STS in 5 (8%), and bowed interlocking distal porous coated in one. Distal diameters utilized ranged from 12- to 25mm, with 15mm being used most frequently (12; 20%). Distal stem lengths utilized were 150mm in 28 hips (45%), 190mm in 27 (44%), 250mm in 5, and 300mm in one. Femoral fixation was augmented by use of cables in 34 hips (56%), a trochanteric grip or plate in 9 (15%), strut allografts in 4 (7%), and crushed cancellous or bone graft substitute in 11 (18%). Two-thirds of procedures included complete acetabular revision (n=40), while 31% (19) involved liner change only and 2 were isolated femoral revisions. Acetabular components utilized were one custom triflange based on preoperative imaging, one cemented all-polyethylene constrained, 5 standard porous hemispheric, and 33 ultraporous metal. Constrained liners were used in a total of 11 hips including the aforementioned all-polyethylene, and dual mobility devices were used in three. Porous metal augments were used in 2 cases including one posterior column buttress and one further reinforced with impaction grafting. Impacted crushed cancellous allograft was used in 6 additional acetabular reconstructions, bone graft substitute was used to fill cavitary defects in one, and femoral head autograft fixed with 2 cortical screws was used to fill a superior defect in the case of severe dysplasia. At an average follow-up of 1.5 years (maximum: 3.7 years) there have been no revisions or failures of the femoral component. Five patients died during the study period, with 2 deaths occurring within 90 days of the index procedure. One was an 88-year-old female with BMI of 14.3 kg/m2 who fell and sustained a Vancouver B3 periprosthetic fracture. The other was a 67-year-old male patient undergoing treatment for liver cancer who was revised for gross loosening with impending fracture of a cemented stem. Both patients had returned for their 6-week follow-up visit. Average Harris hip scores (0 to 100 possible) improved from 44.2 preoperatively to 66.0 at most recent evaluation, while the pain component (0 to 44 possible) improved from 15.8 to 31.2. Complications requiring surgical intervention included intraoperative periprosthetic femur fracture in one patient returned to the operating suite same day for ORIF, which further required incision and debridement for superficial infection at 1 year postoperative; and two patients with dislocation and fracture of the greater trochanter treated with open reduction, revision of the head and liner, and application of cerclage cables, one of which required removal of a migrated claw 10 months later followed 2 weeks subsequently with incision and debridement for a non-healing wound. Postoperative radiographs were available for review for 59 THA in 58 patients. Analysis of the femoral component revealed satisfactory fixation and alignment in 57 hips (97%) with evidence of bone maintenance and healing of osteotomies and fracture sites. Brooker III heterotopic ossification was evident in one hip. Two hips showed evidence of proximal bone loss or radiolucency in one or more zones, but had healing of osteotomy sites. None showed evidence of loosening or subsidence. Early to mid-term results of modular tapered stems used for femoral revision are now being published [5,6,11-18]. One study documented success in achieving implant stability and osteointegration, as well as restoring leg length and offset across all Paprosky classifications . Multiple reports from one institution have demonstrated the success of modular tapered stems for cases of proximal femoral bone loss. The authors demonstrated high mid-term survival rates of 90-94%, maintenance or improvement of bone stock. and low subsidence rates [4,13]. Higher outcome scores, better bone restoration, and less intraoperative fractures were also found with modular tapered stems compared with fully porous coated cobalt-chromium stems [11,12]. In addition, the modular tapered stems were typically used for cases of worse femoral bone loss. Two other papers have documented high mid-term success with these stems in Mallory Type 3C and Paprosky Type 3 and 4 femurs [16,17]. Encouraging early results in treatment of periprosthetic femur fractures with modular tapered stems are also being reported. These stems were used in Vancouver B2 and B3 femur fractures. High rates of fracture union, maintenance of bone stock, and implant osteointegration have been shown in these studies [19,20]. Modular tapered stems are valuable tools in femoral revision cases. The versatility of the design allows for independent attainment of implant fixation and hip stability, which can be challenging with monoblock stems (Figure 2). Figure 2. A 65-year-old male patient with BMI of 38.4 kg/m2 presented to the authors’ practice 3 years after undergoing left revision cementless THA. He complains of pain and difficult ambulation. He described the pain as moderate, in the buttock, and occurring intermittently. Preoperative radiograph (left) reveals a cementless S-ROM revision femoral component with osteolysis and radiolucencies in all zones. Immediate postoperative radiograph (center) reveals treatment with revision of the femoral component and exchange of the polyethylene liner. A cone standard offset body with 22.5mm diameter and 60mm length was used proximally, and mated with a 17x150mm splined tapered straight distal stem. A bone substitute putty was used to fill cavitary defects in the femoral canal. At 2 years postoperative, the patient is doing well with no pain and Harris hip score of 89. Radiograph (right) reveals satisfactory component fixation and position, with progressive healing of osteolytic defects. The tapered geometry of the stem allows for its use even in severe cases of femoral bone loss that preclude the use of fully porous coated stems. Recent advances in design of the modular taper have led to a decrease in cases of stem fracture. In the authors’ patients at an average of 1.5 years follow-up, Harris hip scores were relatively low, but they were significantly improved over postoperative levels, and likely have not reached maximum benefit given the early follow-up. Excellent radiographic results in these patients (satisfactory fixation and alignment of the femoral component in most hips) and early survival are encouraging for the use of this modular hip system in a variety of complex reconstruction scenarios. Frye BM, Berend KR, Morris MJ, Adams JB, Lombardi Jr. AV. Modular Femoral Tapered Revision Stems in Total Hip Arthroplasty. Reconstructive Review. December 2013, volume 3, number 4, pp 32-37. Adapted for ICJR.net with permission from the Joint Implant Surgery & Research Foundation. Sporer SM, Paprosky WG. Revision total hip arthroplasty: the limits of fully coated stems. Clin Orthop Relat Res. 2003;417:203-9. Mallory TH. Preparation of the proximal femur in cementless total hip revision. Clin Orthop. 1988;235:47-60. Lombardi AV Jr, Berend KR, Mallory TH, Adams JB. Modular calcar replacement prosthesis with strengthened taper junction in total hip arthroplasty. Surg Technol Int. 2007;16:206-9. Van Houwelingen AP, Duncan CP, Masri BA, Greidanus NV, Garbuz DS. High survival of modular tapered stems for proximal femoral bone defects at 5 to 10 years follow-up. Clin Orthop Relat Res. 2013;471(2):454-62. Lakstein D, Kosashvili Y, Backstein D, Safir O, Lee P, Gross AE. Revision total hip arthroplasty with a modular tapered stem. Hip Int. 2010;20(2):136-42. Lakstein D, Eliaz N, Levi O, Backstein D, Kosashvili Y, Safir O, Gross AE. Fracture of cementless femoral stems at the mid-stem junction in modular revision hip arthroplasty systems. J Bone Joint Surg Am. 2011;93(1):57-65. Efe T, Schmitt J. Analyses of prosthesis stem failures in noncemented modular hip revision prostheses. J Arthroplasty. 2011;26(4):665. Harris WH. Traumatic arthritis of the hip after dislocation and acetabular fractures: treatment by mold arthroplasty. An end-result study using a new method of result evaluation. J Bone Joint Surg Am. 1969 Jun;51(4):737-55. Gruen TA, McNeice GM, Amstutz HC. “Modes of failure” of cemented stem-type femoral components: a radiographic analysis of loosening. Clin Orthop Relat Res. 1979 Jun;(141):17-27. Brooker AF, Bowerman JW, Robinson RA, Riley LH Jr. Ectopic ossification following total hip replacement. Incidence and a method of classification. J Bone Joint Surg Am. 1973 Dec;55(8):1629-32. Richards CJ, Duncan CP, Masri BA, Garbuz DS. Femoral revision hip arthroplasty: a comparison of two stem designs. Clin Orthop Relat Res. 2010;468(2):491-6. Garbuz DS, Toms A, Masri BA, Duncan CP. Improved outcome in femoral revision arthroplasty with tapered fluted modular titanium stems. Clin Orthop Relat Res. 2006; 453:199-202. Munro JT, Garbuz DS, Masri BA, Duncan CP. Role and results of tapered fluted modular titanium stems in revision total hip arthroplasty. J Bone Joint Surg Br. 2012;94(11 Suppl A):58-60. McInnis DP, Horne G, Devane PA. Femoral revision with a fluted, tapered, modular stem seventy patients followed for a mean of 3.9 years. J Arthroplasty. 2006;21(3):372-80. Wang L, Dai Z, Wen T, Li M, Hu Y. Three to seven year follow-up of a tapered modular femoral prosthesis in revision total hip arthroplasty. Arch Orthop Trauma Surg. 2013;133(2):275-81. Rodriguez JA, Fada R, Murphy SB, Rasquinha VJ, Ranawat CS. Two-year to five-year follow-up of femoral defects in femoral revision treated with the Link MP modular stem. J Arthroplasty. 2009;24(5):751-8. Palumbo BT, Morrison KL, Baumgarten AS, Stein MI, Haidukewych GJ, Bernasek TL. Results of revision total hip arthroplasty with modular, titanium-tapered femoral stems in severe proximal metaphyseal and diaphyseal bone loss. J Arthroplasty. 2013;28(4):690-4. Restrepo C, Mashadi M, Parvizi J, Austin MS, Hozack WJ. Modular femoral stems for revision total hip arthroplasty. Clin Orthop Relat Res. 2011;469(2):476-82. Abdel MP, Lewallen DG, Berry DJ. Periprosthetic femur fractures treated with modular fluted, tapered stems. Clin Orthop Relat Res. 2013 Mar 26 (Epub ahead of print). Munro JT, Garbuz DS, Masri BA, Duncan CP. Tapered fluted titanium stems in the management of Vancouver B2 and B3 periprosthetic femoral fractures. Clin Orthop Relat Res. 2013 May 30 (Epub ahead of print).